The 2018 AIDS Walk Long Beach event was a success with over 155 people registered to participate in the 2nd annual event produced by the LGBTQ Center Long Beach with the sustaining and support sponsorship from Dignity Health, Quest Diagnostics, The Port of Long Beach and Crummitt and Associates. This year also marked the first time the event supported a 5k run with generous support from the Long Beach Frontrunners. 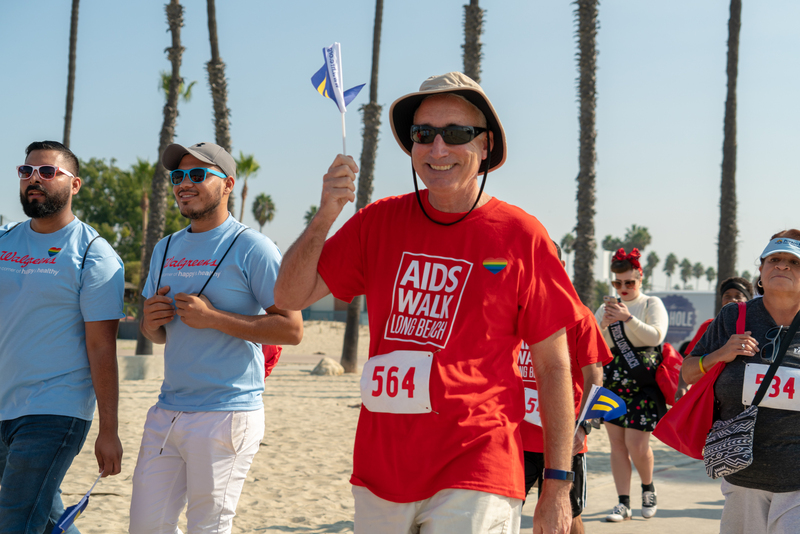 Since its founding in the 1990s, AIDS Walk Long Beach has raised millions of dollars to support those most vulnerable and most in need served by Long Beach-based organizations. Funds raised support critical prevention services including free condoms, HIV and STI testing, food pantry support, case management, PrEp and PEP counseling, medication support, and social and support groups in multiple languages. Each walker who registers will be encouraged to fundraise towards our collective goal each year. Funds collected will support not only the LGBTQ Center of Long Beach’s programs and services, but also local benefiting agencies that provide services for people impacted by HIV/AIDS. There will be no minimum fundraising total for walkers this year, however, monies raised by individual or team walkers will support: mental health services, food bank services, emergency support funds, medical case management, appointment transportation and support for children. AIDS Walk Long Beach brings awareness and support to local organizations giving services to people and communities impacted by HIV. AIDS Walk Long Beach exists because there are many organizations in our community who benefit from community support to serve those impacted by HIV. That is why the walk highlights a unified voice among local organizations, supporting local organizations, with the goal to bring an end to HIV. Thank you to our amazing sponsors for their endless support and encouragement. It’s with community support theirs that we are able to achieve our goals of ending this epidemic in our city. Check out the 2018 Sponsorship Opportunities Here! Thank you for choosing to support Long Beach AIDS Walk and the many organizations that have joined to support local efforts to make programs and services accessible to those living with HIV in our community. Your efforts to raise money for those organizations and the Center will help continue the amazing work we are dedicated to provide. Creating a team of people to help raise money makes asking for donations much easier. A team of local daily walkers or a newly established walking group of co-workers can encourage support from many with simple posts, calls to action and email. Here’s how you can start your own team and start towards your set goal to help stop HIV in Long Beach. Bringing awareness and support to local organizations giving services to people and communities impacted by HIV is the mission of AIDS Walk Long Beach. The best way for us to achieve that mission is by coming together as a community. Volunteers are the backbone of events like AIDS Walk Long Beach, providing the much needed encouragement to walkers in the morning, staffing rest stops along the route and passing out water or helping stage the finish line event at the Long Beach Museum of Art. Your energy and support are what makes this event possible. If this is your first time or your 10th time walking, we always have questions and we’re here to help. If your question isn’t answered bellow, please do not hesitate to email our Health Services team who will be glad to offer some assistance! Is there a minimum fundraising goal like last year? How do people donate towards my team or individual fundraising page? Which local organizations is AIDS Walk Long Beach supporting this year? The walk will start checking in pre-registered and same day walkers at 9:00am at Alfredo’s Beach Club located on Granada Beach. Once everyone is registered we will begin the 5k run at 9:30am and the 5k walk will start at 10:30am. Most participants can complete the 5k course in about 30-90 minutes depending on the speed. We are looking at closing the course at 1:00pm and wrapping up food/drink services by 1:30pm. No. There is no fundraising minimum for any participant this year, however, we still encourage participants to raise money to support amazing organizations in Long Beach. Individual participants and teams with the highest amounts raised will be acknowledged at the event and a few swag items will be available for amounts raised. If you registered before the walk continue using your page to raise money towards your personal goal. We will keep donations pages open until December 21st allowing for pre-registered and same day registered participants to ask their friends and family for donations. If you haven’t registered a page before the walk simply scroll up and click the link to donate to a “participant or team” for this year’s walk. Enter the participant or team name along with your information and we will credit that participant or team with the donation. Thank you to Taka Kaguma and David Garrett for the amazing pictures! Do you have more pictures you can share with us? Post them on our Facebook Page and tells us a bit about your experience at the walk this year.